Cuba Destination Weddings have become the best value in Caribbean weddings. Many hotels offer free wedding packages and great incentives for booking at their hotel. Cuba Destination Weddings are becoming more and more popular not only because of the beauty of Cuba’s beaches and all inclusive wedding resorts, but because of the value you get for your money. 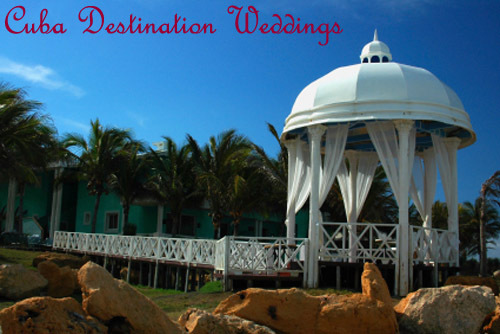 At All-Inclusive-Weddings.com Cuba destination weddings couldn’t be easier. Book your hotel rooms with us and we take care of your destination wedding planning at absolutely no charge. 2. Free Cuban Destination wedding planning. 3. A team of planners dedicated to making your dream wedding go off without a hitch. Our Couples are deciding on Cuban destination weddings more and more because Cuba has become the best value in Caribbean destination weddings. Cuba is one of the last destinations that has many hotels offering free wedding packages and great incentives to couples for booking their wedding party into their resort. We have great deals on Cuba wedding packages from Canada and Europe. Ask one of our planners, they’d be more than happy to answer any questions you may have and help you make confident decisions about your big day. Saying your vows to the love of your life with the beautiful backdrop of the Caribbean and the white Cuban sand between your toes is enough to make even married couples want to do it all over again. Not to mention the Cuban music! Guaranteed the band they have playing at your Cuban wedding resort will be better than anything you ever imagined. There’s just something about Cuban music that makes you fall in love every time you hear it. Pricing your Cuban destination weddings couldn’t be easier, the average all inclusive Cuban wedding costs about the same as the average honeymoon. The first step is to decide on a Cuban wedding location. This will depend highly on where your group is flying out of. If you’re all flying out of the same city in Canada then you may decide on one of the quiet Cuban wedding locations like Cienfuegos or Holguin. However, if you’ll have guests flying from multiple departure points you’re better off picking a Varadero wedding resort or even one in Havana that has more flights flying into them. The smaller destinations in Cuba rely solely on charter flights and will become a logistical problem for getting all of your guests to your dream Caribbean wedding. Once you’ve decided on a Cuban wedding destination choose a couple hotels that you think you’d like to vacation at and drop us a line. Our planners will give you a group rate, tell you what incentives those hotels offer and even steer you toward the hotel that does a better job at pulling off Cuba destination weddings. Remember that if you decide to book your hotel with All-Inclusive-Weddings.com we’ll serve as your personal wedding planners and liaison to the hotel at no additional cost. Drop us a line and we’ll start the process of making your destination wedding dreams come true.